Winner of the International Society for Performance Improvement (ISPI) Award of Excellence for 2008 Selected for the 2008 ISPI Award of Excellence for Outstanding Communication Foreword by Marshall Goldsmith While many supervisors know how to identify flaws in their employees' performance, only the best managers truly know what it takes to fix the problem. A Manager's Guide to Improving Workplace Performanc e offers a practical, step-by-step approach to guiding employees to excellence by analyzing their problem areas, developing creative solutions, and implementing change. 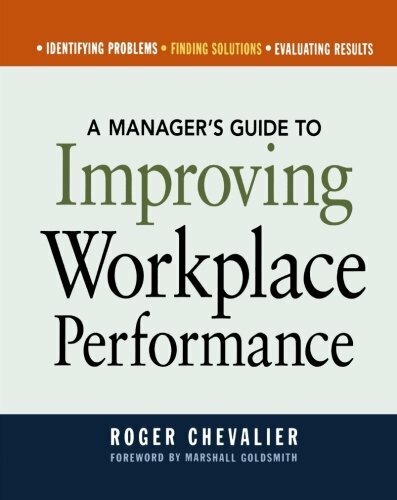 Employee performance expert Roger Chevalier has helped thousands of managers and human resources professionals to bring out the best in their workers. Using case studies and real-life examples, he shows supervisors how to take their employees from good to great by: * using tools like the Performance Coaching Process, Performance Counseling Guide, and Performance Analysis Worksheets * tailoring the amount of direction and support to an employee's specific abilities and motivations * applying the Situational Leadership model to teams and individual employees. Practical and authoritative, this book offers a positive, yet realistic solution for one of the greatest workplace challenges facing managers.